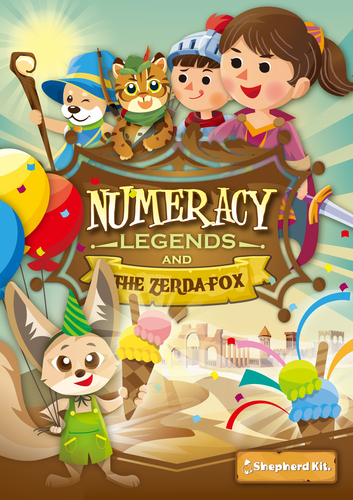 In this game, players take on the role of a hero who is trying to deliver a cupcake to the Zerda Fox. The Fox is found at the Ice Cream Truck at the bottom of the board. In order to get there, you’ll have to travel from your starting tent at the top of the board and through the Colorful Desert to deliver said cupcake. To setup the game, take the five decks of creature cards (can separate by color) and shuffle each deck and place on the appropriate space on the board. Each of the creature cards has a monster on it – belonging to one of four different races – and each has a different appetite in the number of cupcakes that it wants to eat. Each play chooses their hero and takes 15 cupcake tokens to start. Each player places their hero in one of the starting tents; there is no limit to the number of heroes that can start in any particular tent. On a turn, the player must either move his hero downward (towards the ice cream truck) along the connecting paths OR stay in the same space. You can only move one space per turn. After moving, you take the top card of the creature deck that matches the color of the space that you ended on. You read the card and then discard cupcakes equal to the appetite of the revealed creature. The creature card is then placed on the bottom of the deck from which it came from. If you stay in the same place, you can either draw a single cupcake token from the supply OR you can collect a scoop of ice cream. The ice cream comes in different colors which match the color of the different creature races. You can use a scoop of ice cream to replace a cupcake when you have the same color ice cream as creature color. The good news is that the ice cream is not consumed when you use it. You can never have more than 15 Cupcake tokens. If you ever run out of cupcakes, you must return to a start tent – though at least you get a full supply of 15 Cupcakes when you restart your journey. 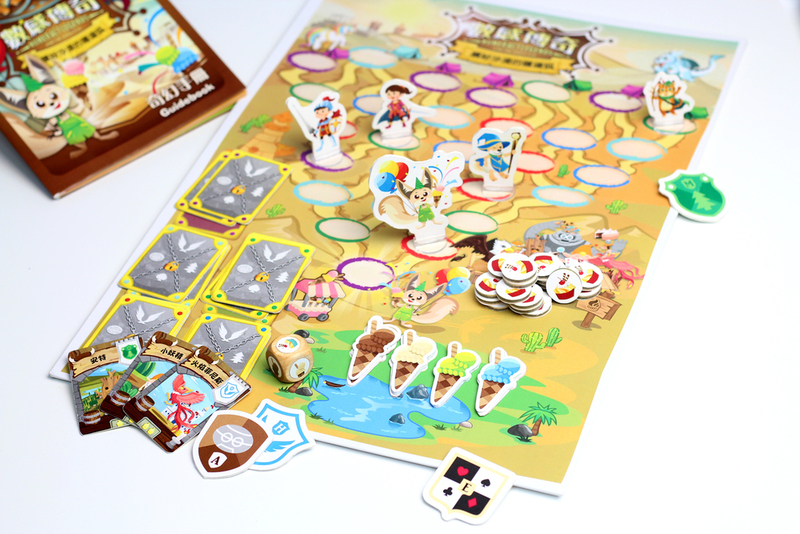 The game ends when any player makes it to the bottom of the board and is able to deliver at least one cupcake to the Zerda Fox. Note that you must be able to feed the creature on that final space AND then have at least one cupcake left over to give to the Zerda Fox in order to win. There is an advanced version of the game which challenges players to be the first to make three successful trips through the desert – each time starting with only 12 cupcakes. The game can be further advanced by adding in the race tokens – each player is given a race token, and when you encounter a creature in the game that matches your race token, you don’t have to pay any cupcakes! Well, I should start by saying that I haven’t been around any of my nephews or nieces yet this summer, so I haven’t been able to play this with young kids – however, even so, none of them may be old enough / sophisticated enough to really enjoy this one as the oldest relative is not quite 5 years old. I wish that the box or rules at least gave some recommendation on the ages that they think this is appropriate for. The artwork on box certainly looks to be targeting early elementary school ages. The decision making tree can be pretty simple; you can just move your hero each turn, flip over the card and then hope for the best. Of course, you’re not learning much about probability if you go about the game this way. (I have since spoken with the publisher and he has confirmed that the lower end of the age range will be 5+ or 6+). So, my problem with reviewing the game is that I’ve haven’t seen it in action with a youngster to see how they really process it. The three basic decisions are pretty simple, though I am not sure how easily a 6 or 7 year old would be able to grasp the idea of choosing an ice cream scoop on a turn in order to save cupcake expenditure later in the game. That is a fairly advanced concept to understand, though the flexibility of young kids’ minds never ceases to amaze me. The final page of the rulebook does try to help analyze the game and explain how to apply the probability issues in the game. In short, you have to memorize the cards – or play the game enough to remember what the cards are. The game wants you to know which cards you might find in each stack AND then remember the order that they were revealed in during the game (So that you know when they might come back up again) in order to plan your moves. I think that this is definitely a good way to teach this concept, but I just don’t think that you can do this with a younger kid – and the artwork and otherwise simplified gameplay don’t seem to be right for a middle schooler (which is about the level of sophistication that I think you need in order to be able to memorize card distribution as well as revealed card order during the game). Maybe things are different in Taiwan – actually, I’m pretty sure that they are given some of the poor scores that American schoolkids have been getting – but there seems to be a mismatch between the graphic presentation of the game and the level of reasoning needed to play it. Rating – Honestly, I can’t give a rating to this as I haven’t been able to play this with either a child of suitable age. I am going to give this game as a gift to my nephews (5yo) later this summer, and I will try to report back with their experiences. Perhaps I am grossly underestimating the abilities of youth these days… I can see a younger child being able to memorize (or become quite familiar) with the types of cards in each stack with multiple plays – as kids often have unbelievable memory skills – but just how good is that memory? Not sure without seeing it myself. I have passed the game onto my nephews, and I await a report back from them later this summer. When I was demoing the first game in this series The Rainbow Unicorn it was clearly stated that these games are primarily aimed for the children’s market and that the games in order bring new and more complex mechanisms each game. Rainbow Unicorn for example is primarily pick and deliver resources to get the magic cupcake.